It is sometimes quite difficult to determine the difference between 2 star and 3 star hotels since there is a wide variety of hotel rating systems in the tourism and hospitality industry. Most of the systems use a star rating system, with the greater number of stars indicating greater luxury. Although there are some differences between these various ratings, most of them are quite similar. 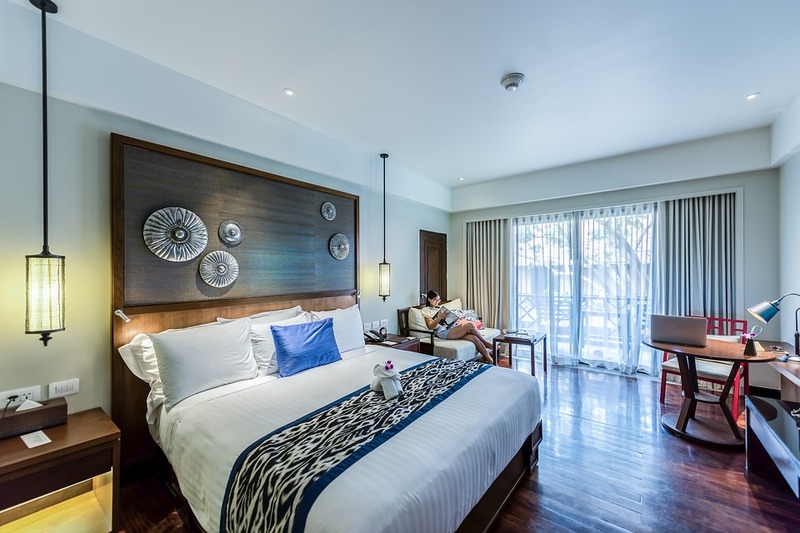 The main difference between 2 star and 3 star hotels is their room options; 2 star hotels offer basic room options whereas 3 star hotels offer multiple room options. All in all, 3 star hotels are more spacious and comfortable than 2 star hotels. 1. What is a 2 Star Hotel? 2. What is a 3 Star Hotel? 3. What is the difference between 2 Star and 3 Star Hotel? 2 star hotels typically offer basic and clean accommodation. The hotels are small to medium size, typically containing about 2-4 stories. They are usually located near major intersections, public transportation centers, and affordable tourist attractions. Most 2 star hotels do not have on-site restaurants but provide continental breakfast. These hotels are usually within walking distance from good low-price dining. 2 star hotels only have basic room options. Rooms are also small to medium sizes and offer basic amenities, a private bathroom (typically shower only), TV, telephones, clothes racks or small closets. Daily housekeeping service and 24-hour reception are also offered by 2 star hotels. However, services like room service, baggage service, and valet parking are not usually available in 2 star hotels. 3 star hotels are more spacious and comfortable accommodations than 2 star hotels. They are above average in quality and place greater emphasis on comfort and service. They have multiple room options and rooms are spacious and have good-quality amenities. 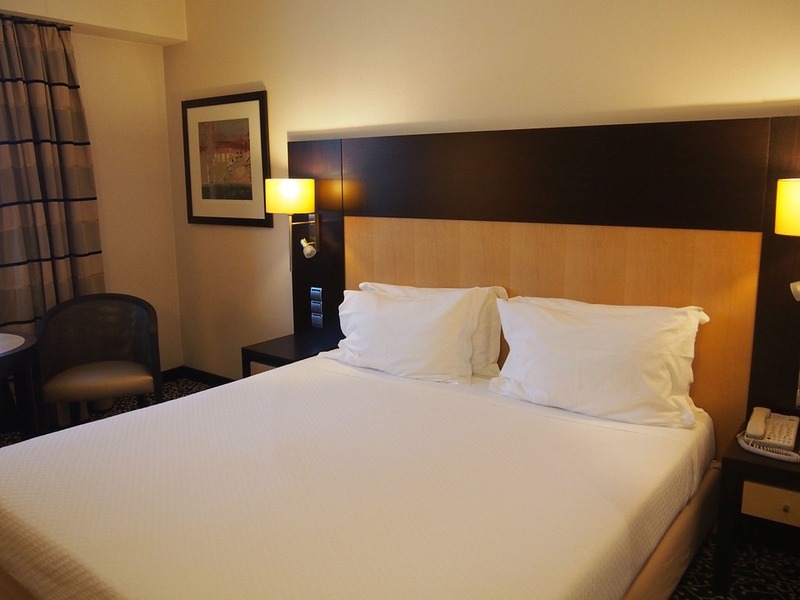 Rooms have high-quality bedding and comfortable furniture. Bathrooms are larger and offer shower/tub combinations. Room service is also available in 3 star hotels although 24 hours room service is reserved for hotels with higher quality. Many 3 star hotels have onsite restaurants, bars, pools, fitness centers, and well-designed lobbies. Restaurants are usually medium sized and offer breakfast through dinner. The public spaces such as dining rooms, lobby, outer grounds, etc. will be spacious and well-maintained. Baggage services, on-site medical assistance and valet parking may also be available in these hotels. Meeting and conference facilities will be also available in 3 star hotels. 2 Star Hotels offer basic room options. 3 Star Hotels offer multiple room options. Most 2 Star Hotels don’t have on-site restaurants. 3 Star Hotels often have their own restaurants. 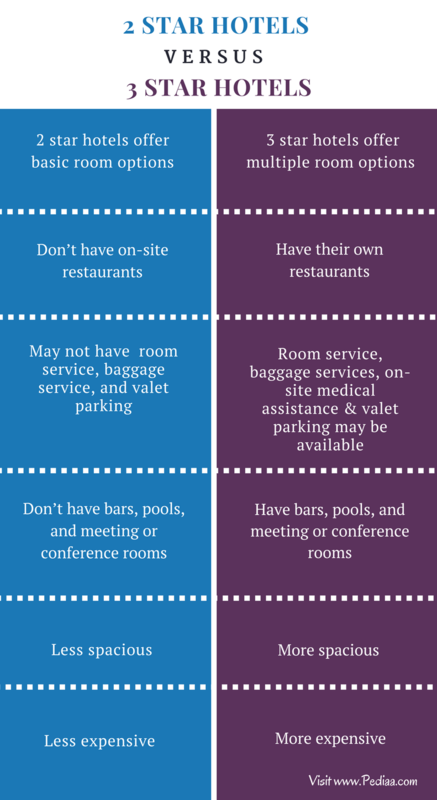 2 Star Hotels don’t have services such as room service, baggage service, and valet parking. Room service, baggage services, on-site medical assistance and valet parking may be available in many 3 Star Hotels. 2 Star Hotels don’t have bars, pools, and meeting or conference rooms. Many 3 Star Hotels have bars, pools, and meeting or conference rooms. 2 Star Hotels: The hotels, as well as the rooms, have less space. 3 Star Hotels: These hotels are more spacious and have bigger guest rooms and bathrooms. 2 Star Hotels are less expensive than 3 star hotels. 3 Star Hotels are more expensive than 2 star hotels.